Faculty Life aims to support faculty through the various stages and processes involved in an academic appointment. From leading the appointment and onboarding processes through supporting faculty as teachers, researchers and clinicians, Faculty Life seeks to integrate these functions seamlessly and identifies efficiencies in processes and programs. The office includes three divisions: Non-Salaried Faculty, Faculty Development and Continuous Professional Development. Click here for a list of priorities and focus areas for each team member. Andrea Berry holds a Master’s degree in Public and Nonprofit Administration and majored in Health Sciences and Administration for her undergraduate degree. She has worked in medical education for over 14 years and has a strong perspective of both the student and faculty experience in the field. Beginning her career as a Student Affairs professional, Ms. Berry advised medical students on curricular issues and career decisions. She also became engaged in work-based learning principles and strategies as she guided faculty and residents in the clinical learning environment. As part of her position as Director of Faculty Development at a new College of Medicine, she has had the opportunity to work side-by-side with the faculty as they design and deliver the innovative curriculum and assessment programs. She is particularly interested in the clinical curriculum and has created several regionally recognized programs designed to support physicians in their medical education roles. She was invited to serve on a national inaugural committee on faculty development and has given over 50 invited lectures on clinical teaching topics. Her research interests include geriatric curriculum and education, clinical teaching and learning, and how medical students navigate curriculum and form professional identities through the medical school experience. Andrea is a member of the following groups: AAMC’s Medical Education Scholarship, Research and Evaluation (MESRE) Faculty Development Committee; Core Entrustable Professional Activities for Entering Residency (CAPAER) Learner Community Phase II, Faculty Development Group; SGEA Faculty Development Special Interest Group; SGEA Collaborate at a Difference for Medical Education Group. Angie Irvin has worked in the healthcare industry for the past four years. After graduating with her Bachelor of Economics degree from the University of Florida, Ms. Irvin worked for a nerve regeneration company in their marketing department. Ms. Irvin also has a background in Human Resources because of her previous experience as an Assistant Store Manager with Target. Ms. Irvin joined the faculty development team in the College of Medicine and is currently serving in the Assistant Director role. Her healthcare background and organizational aptitude have aided in the implementation and creation of faculty development initiatives and programs. Angie is currently pursuing a MBA degree and is interested in facilitating professional development programs for faculty and residents. Angie is the Vice Chair of the SGEA Faculty Development Special Interest Group. Lacy Stallings has joined the Faculty Development team as the Coordinator of Faculty Development Academic Programs. She graduated from UCF with a Bachelor’s degree in Interdisciplinary Studies and soon after joined the United States Peace Corps, where she served 28 months in Namibia, Africa as an educator and female youth leadership facilitator. During this time, Ms. Stallings worked closely with the Ministry of Education, teachers, and community members to reform and enhance the region’s educational curriculum. Ms. Stallings is a seasoned traveler with an extensive background in the Service & Hospitality industry. She has her CAPM (Certification in Associate Project Management) and has worked as a contracted Project Manager in New Zealand for a district health board in Maori Health. She looks forward to growing and adding value within COM while simultaneously gaining her MBA. 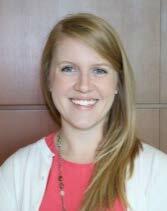 Alaina West has joined the Faculty Development team as the Continuous Professional Development (CPD) Coordinator. 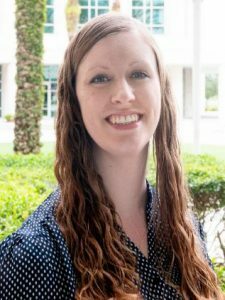 She has been with the UCF College of Medicine since 2012 and served in various roles, including the Faculty and Academic Affairs Office Manager and Medical Education Administrative Assistant. Ms. West received a Bachelor of Science degree at Kent State University in Ohio while simultaneously managing the Live Entertainment office for Cedar Fair Entertainment Company. She continued her role with Cedar Fair until 2012 when she moved to Orlando. Her experience at the College of Medicine and extensive administrative background will play a key role in her success as the CPD Coordinator. Liz Ivey worked in education for 11 years as a kindergarten teacher for a small elementary school in Winter Park. She graduated with her degree in Psychology from the University of Central Florida. Ms. Ivey returned to UCF to study early childhood education, as part of her continued professional development. She also has a background in customer service through her previous experience as a credit union teller and retail supervisor. 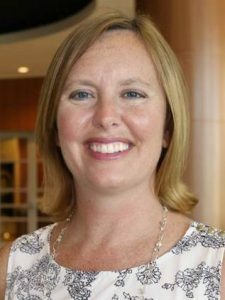 Ms. Ivey joined the UCF College of Medicine in November 2016 as the Faculty Development and Affiliated and Volunteer Faculty Program Administrative Assistant. She looks forward to growing with the college and the Faculty Affairs department. Carolyn Castro-Pagan is a founding member of UCF College of Medicine team with over twenty years of experience in Business Administration, Human Resources, Recruitment, Planning & Project Management for both the private and public sectors. She graduated with an Associate’s Degree in Business Administration from Instituto Comercial de Puerto Rico and has completed certification courses for human resources information systems, database management, project management and professional development series. She moved to Florida from New York City in 2002, where she worked at Council of State Governments, Port Authority of NY & NJ in the World Trade Center as the agency’s conference planner and administrator for all policy related workshops representing analysts, state legislators and constituents nationwide. 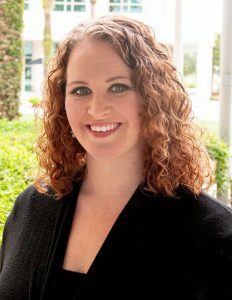 Ms. Castro-Pagan joined UCF College of Medicine in December, 2010 as the human resources office manager and was promoted to executive faculty recruiter within her first year. Subsequently, she began working in the Office of Faculty & Academic Affairs, as the administrator of the affiliate and volunteer faculty program and manages the business processes for all non-salaried faculty in the college. Carolyn is also the expert lead in the college’s PeopleSoft system for non-salaried faculty. She has won awards in excellence for MD program support and was named UCF Innovator in 2014 as co-inventor of PACTS (Participation Activity and Credentialing Tracking System), officially copyrighted and registered with the United States Patent and Trademark Office, sponsored by UCF’s Office of Technology Transfer. Mario Alequin has more than 8 years of experience in customer service with his background in sales. He graduated from La Salle University in Philadelphia, PA with an Associate’s Degree in Arts. In 2011, he decided to relocate to Florida. Mr. Alequin joined the UCF College of Medicine in October 2016 as a Program Assistant for the Affiliated and Volunteer Faculty Program. He looks forward to growing with the college and the Faculty Life Office, while also learning more about the different departments within the college. What Fosters Professional Identity Development in Medical School¸ was awarded the Southern Group on Educational Affairs, 2013-2015 Medical Education, Scholarship, Research (MESRE) Grant. This project is also supported by the OCF Office of Research & Commercialization Undergraduate Research Initiative. Investigators: Denise Kay, PhD and Andrea Berry, MPA. Student Social Media Perceptions and Practices: A Framework for Social Media use in Medical Education Curriculum. Investigators: Monica Bailey,MA, Andrea Berry, MPA and Joseph Caravaglio. Bridging the Gap between Medical Students and Independent Seniors, was awarded the Richard Tucker Gerontology Applied Research Award. Investigators: Mariana Dangiolo, MD and Andrea Berry, MPA. “Geri-Anatomy”: Integration of Geriatrics by Student Peer Mentors into an Anatomy Curriculum, was awarded the Richard Tucker Gerontology Applied Research Award. Investigators: Malgorzata Krzyszczak, Christina Hsu, Reid Green, Edward Sanchez, Mariana B Dangiolo, MD and Andrea Berry, MPA. Validation of a Clinical Educator Coaching Assessment Tool. Investigators: Andrea Berry, MPA, Denise Kay, PhD and Monica Bailey, MA. Navigating the Diverse Pedagogies of a 21st Century Medical School. Investigators: Denise Kay, PhD and Andrea Berry, MPA. Kay D, Teal CR, Crites G, Berry A, Hurtubise L, Hall E, Khalil MK.. “Being There” – Building Productive Scholarly Teams across Distance and Over Time. Journal of Regional Medical Campuses 1(2). Dangiolo M, Gorman A, Cowan M, Berry A. Advance Directives. Portal of Geriatrics Online Education (POGOe); 2017. Available from: https://www.pogoe.org/productid/21963..
Dangiolo M, Bailey M, Berry A. Introduction to the Geriatric History and Physical Exam. Portal of Geriatrics Online Education (POGOe); 2016. Available from: https://www.pogoe.org/productid/21875. Dangiolo M, Berry A, Heizmann J, Furer S, Doctor M. Systems-Based Geri-Anatomy Curriculum. MedEdPORTAL Publications; 2016. Available from: https://www.mededportal.org/publication/10329 http://dx.doi.org/10.15766/mep_2374-8265.10329. Bailey M, Kay D, Berry A. Introduction to Entrustable Professional Activities Faculty Development Module. MedEdPORTAL Publications; 2015. Available from: https://www.mededportal.org/publication/10230. Dangiolo M, Gillum S, Clark N, Berry A. Geriatric EMR Templates. POGOe – Portal of Geriatrics Online Education; 2013. Available from: http://www.pogoe.org/productid/21620. Charles, N., Green, A., Henricksen, L., Kaho, J., Knebl, J., McCabe, J., Oglesby, M. “Preclinical Medicine.” Guidebook for Undergraduate Medical Education Administration. Ed. Chandler, M., Ed. Engle, K., Ed. Hunt, Ann Marie. Washington DC: Alliance for Academic Internal Medicine, 2014. In press. Co-authored professional development chapter. Dangiolo M, Gillum S, Berry A (2014). “Geri-Anatomy”: Integration of Geriatrics by Student Peer Mentors into an Anatomy Curriculum. Journal of American Geriatric Society Abstract Supplement,C121: S209. Gorman L, Berry A, Dangiolo M. Integration of innovative geriatric pharmacology educational tools into a fourth year geriatric elective improves geriatric pharmacotherapy knowledge and competency. International Association of Medical Science Educators (IAMSE) meeting, May 2018, Henderson, Nevada. Berry A. Evaluation of educational innovations as scholarship. (Invited Presentation). 2018 Southern Group on Educational Affairs (SGEA) Annual Meeting, April 19-21, 2018, Jackson, Mississippi. Kleinheksel A, Wyatt T, Griffin A, Bailey M, Berry A. Beyond “Did you like it?”: A Workshop to Expand Models of Faculty Development Evaluation. 2018 Southern Group on Educational Affairs (SGEA) Annual Meeting, April 19-21, 2018, Jackson, Mississippi. Lacy N, Berry A, Ward C, Martin L, Jackson L. Data for program evaluation stakeholders: Reporting plans and distribution considerations. 2018 Southern Group on Educational Affairs (SGEA) Annual Meeting, April 19-21, 2018, Jackson, Mississippi. Bailey M, Griffin A, Berry A. Moving Beyond Exceeds Expectations: Strategies for writing meaningful narrative evaluation. 2018 Southern Group on Educational Affairs (SGEA) Annual Meeting, April 19-21, 2018, Jackson, Mississippi. Berry A, Alequin M, Bailey M, Castro-Pagan C, Griffin A, Ivey E, Orengo C, West A. Establishing a faculty life office. 2018 Southern Group on Educational Affairs (SGEA) Annual Meeting, April 19-21, 2018, Jackson, Mississippi. Griffin A, Bailey M, Berry A. CVs and EPs: How to utilize your Curriculum Vitae and Educators Portfolio to maximize your professional development. 2017 Southern Group on Educational Affairs (SGEA) Annual Meeting, April 19-23, 2017, Charlottesville, VA.
Berry A, Tucker C, Kurz T, Smith A, Griffin A. Wellness and resilience across the continuum: Interventions for students, residents and faculty. 2017 Southern Group on Educational Affairs (SGEA) Annual Meeting, April 19-23, 2017, Charlottesville, VA.
Griffin A, Bailey M, Berry A, Cendan J. Developing an online presence: A review of tools that facilitate faculty professional development. 2016 Association of American Medical Colleges (AAMC) Annual Meeting – Learn Serve Lead, November 11, 2016, Seattle WA. Berry A, Griffin A, Bailey M. Comparison of an online versus face-to-face Resident as Teacher program: Strengths and weaknesses of each approach. 2016 Association of American Medical Colleges (AAMC) Annual Meeting – Learn Serve Lead, November 11, 2016, Seattle WA. Riddle J, Cianciolo A, Berry A, Blanco M, Borges N, Boscardin C, Huggett K, Rougas S, Uijtdehaage S. Evaluation of educational innovations as scholarship. 2016 Association of American Medical Colleges (AAMC) Annual Meeting, November 11, 2016, Seattle WA. Kay D, Berry A, Kibble J, Griffin A, Bailey M. Radical perspectives in curriculum development: Using role immersion to imagine the curriculum of the future.2016 Southern Group on Educational Affairs (SGEA) Annual Meeting, April 14, 2016, Austin, TX. Kay D, Coles N, Berry A. Think, Act, Feel: Catalysts for Medical Student Identity Development. 2016 Southern Group on Educational Affairs (SGEA) Annual Meeting. April 15, 2016, Austin, Texas. Hurtubise L, Crites G, Souza K, Crow S, Berry A, McKenzie S, Kay D, Gaines J, Hall E. New Strategies to Collaborate, Innovate, and Disseminate at a Distance. 2015 Generalists Annual Meeting, November 8, 2015, Baltimore, Maryland. Hurtubise L, Crites G, Souza K, Crow S, Berry A, McKenzie S, Kay D, Gaines J, Coschigano P. AAMC Small Group Virtual Collaborative – WGEA, GRMC, and SGEA – Web based collaboration in medical education. 2015 AAMC Southern Group on Educational Affairs Annual Meeting, April 23, 2015, Charlotte, North Carolina. Kay D, Berry A, Coles N. What experiences in medical school trigger professional identity formation? 2015 AAMC Southern Group on Educational Affairs Annual Meeting. April 24, 2015, Charlotte, North Carolina. Berry A, Peterson C, Tucker C, Howley L, Nagler A. Are medical school faculty prepared to teach 21st century skills to future physicians? AAMC Southern Group on Educational Affairs Annual Meeting. April 24, 2015, Charlotte, North Carolina. Berry A, Kay D, Bailey M. Shaping your curricular identity. AAMC Southern Group on Educational Affairs Annual Meeting, March 13, 2014, Miami, Florida. Gaines J, McKenzie S, Berry A, Kay D, Crites G. Scholarly Collaboration at a Distance: Tools Available for and the Potentials of Web-based Solutions for Peer-to-Peer Networking. AAMC Southern Group on Educational Affairs Annual Meeting, March 14, 2014, Miami, Florida. Berry A, Kay D, Smith S, Monroe M. Diagnosing your learner: Building bridges between educators and student affairs. AAMC Southern Group on Educational Affairs Annual Meeting, April 19, 2013, Savannah, Georgia. Kay D, Berry A. Professional development in social media initiative. International Higher Education Teaching and Learning Conference, January 14, 2013, Orlando, Florida. Bailey M, Berry A, Griffin A. An Innovative Program for Bolstering Research in Medical Education. 2017 Southern Group on Educational Affairs (SGEA) Annual Meeting, April 19-23, 2017, Charlottesville, VA.
Sleight D, Parker C, Berry A. Approaches to academic detailing in two community-based medical schools. 2016 Association of American Medical Colleges (AAMC) Annual Meeting, November 11, 2016, Seattle, Washington. Berry A, Kay D, Griffin A, Bailey M. Advancing Clinical Educators through the use of an Online, Coaching-Oriented Program: Validating a Self-Assessment Clinical Teaching Tool. .2016 Southern Group on Educational Affairs (SGEA) Annual Meeting, April 14, 2016, Austin, TX. Bailey M, John E, Carlyle D, Smith S, and Berry A. Medical Students’ Social Media Practices and Preferences. 2015 Southern Group on Student Affairs (SGSA) Annual Meeting, April 18, 2015, New Orleans, LA. Bailey M, Berry A. Developing a digital presence: The use of Twitter as a professional development tool. 2014 AAMC Annual Meeting, November 8, 2014, Chicago, Illinois. Dangiolo M, Gillum S, Berry A. “Geri-Anatomy”: Integration of geriatrics by student peer mentors into an anatomy curriculum. 2014 Annual Scientific Meeting of the American Geriatrics Society, May 16, 2014, Orlando, Florida. Berry A, Doctor M, Furer S, Heizmann J, McKinnon C, Dangiolo M. Student facilitated imagery: A new twist on geri-anatomy curriculum. AAMC Southern Group on Educational Affairs Annual Meeting, March 14, 2014, Miami, Florida. Berry A, Kay D. Redefining RIME to assess student competency: A framework for and by clinical educators. AAMC Southern Group on Educational Affairs Annual Meeting, April 18, 2013, Savannah, Georgia. Dangiolo M, Berry A, Golden A. Implementing an innovative 4 year geriatrics and palliative medicine curriculum in a new medical school. AAMC Southern Group on Educational Affairs Annual Meeting, April 18, 2013, Savannah, Georgia.